Like nurses and police officers, we always need teachers. And while it’s possible to get a teaching job with only a bachelor’s degree, you’re severely limiting your options for pay increase and promotion without a master’s. In most school systems, a master’s degree – whether a Master of Arts, Master of Science, or Master of Education – is an automatic pay increase, as well as a minimum requirement for higher positions. But, of course, many teachers begin working right out of college, and once you’re in the classroom, you realize there’s not that much time for anything else. Many working teachers want to earn a master’s degree, but cannot stop working to go back to school. Education has long been a good candidate for distance education, since teachers tend to be dedicated, self-motivated students as well, so it’s a natural progression for colleges and universities to begin offering graduate degrees in education online. That leaves us with only the Top 50 out of 179 eligible schools. Our formula is focused to find the institutions that give students the best combination of quality and affordability, ensuring a strong return on investment. After all, teaching is a rewarding job, but not a lucrative one – every dollar counts. Value Colleges is committed to helping prospective students make the most out of those dollars. Value Colleges’ #1 Best Value Online graduate degree in education comes from the University of Houston, a major public research university in Houston, TX. Well regarded by U.S. News & World Report and the Princeton Review, the University of Houston has been experimenting with using technology for education for a long time – since at least 1953, when their television station KUHT was launched as the first educational TV station, broadcasting classes long before streaming lectures was even conceivable. That drive to make education accessible, even to those who cannot attend classes on campus, continues today in UH’s Distance Education program, which offers hundreds of courses and dozens of accredited degrees, including numerous Master of Education degrees. Online students can earn a master’s degree in Curriculum and Instruction – Early Childhood; C&I – Health Science; C&I – Mathematics; Higher Education; and Special Education. At $414 per credit hour, the University of Houston offers a top-notch education at a reasonable price. Located in Arlington, TX, a smaller city in the Dallas-Fort Worth metropolitan region, the University of Texas at Arlington is rapidly becoming a public university to watch. Named a Next Generation University by the New American Foundation, UT Arlington is one of the fastest-growing institutions in the US thanks to its Texas-sized ambition and expansion of a powerful online education program. UTA offers two Master of Education degrees for online students: the M.Ed. in Educational Leadership and Policy Studies is a model cooperative program built in concert with the Arlington, TX school system and other area districts to prepare educators for administrative roles; the M.Ed. in Curriculum and Instruction prepares educators with higher-order theory and developmental skill, with concentrations in Literacy Studies, Math Education, or Science Education. With tuition at only $273, it’s no surprise UT Arlington is growing by leaps and bounds – it’s as close to a sure thing as you get investing in an education. Purdue University, in West Lafayette, IN, is one of the most recognizable names in higher education, and not just for their legendary basketball and football teams. Ranked by U.S. News & World Report as one of the top public universities, and a top 10 graduate university, Purdue is also a major public research university best known for their STEM research, especially in engineering. It’s no surprise, then, that their online degree programs would also come highly recommended, or that their online Master of Science in Education would steer toward the technical. Online students can earn a MSEd in Learning Technology and Design, focused on developing instructional materials and tools, or in Special Education, with particular emphasis on designing evidence-based instruction plans for children with disabilities. As a public university, Purdue keeps their tuition low, at $329 for Indiana residents, a significant value for a degree that can compete with just about any other in the world. As one corner of the influential Research Triangle (along with Duke University and UNC Chapel Hill), North Carolina State University is one of the major public research universities in the nation. NCSU’s College of Education is just as competitive and innovative as that reputation would suggest, with a top 5 faculty for education research and over $10 million in funding, as well as high success rates in graduation and employment for graduates. NCSU has been expanding their online offerings in recent years, and online students can now earn Master of Education degrees in a number of concentrations: Adult and Community College Education; Counselor Education; New Literacies and Global Learning; Digital Learning and Teaching; Elementary Education; Science Education; Technology Education; and Training and Development. At around $436 per credit, NCSU offers an education that is a trustworthy investment. Utah State University, in Logan, UT, is Utah’s only land-grant university, and according to the land grant mission, exists to provide an accessible, useful education to the citizens of Utah. Land-grant universities have a big job, and the only land-grant university in a large, heavily-rural state with a spread-out population has an even bigger job. USU has wisely chosen to meet this challenge by developing online degree programs, so even students who can’t reach campus can earn a degree. USU’s College of Education and Human Services is one of the best in the nation, with numerous U.S. News & World Report top 10 programs and the fourth highest rate of funding for research. USU offers an online Master of Education degree in Career and Technical Education, as well as a Master of Science in Instructions Technology & Learning Sciences for educators of a more technological interest. At a tuition rate of around $321 per credit hour, Utah State is making education affordable and reachable for a great many people who call Utah home. One of the largest and most respected public research universities, Texas A&M University (in College Station, TX) is a land, sea, and space-grant institution with one of the largest endowments for research in the US. TAMU’s College of Education and Human Development is one of the most impressive anywhere, with ten dedicated research centers and world-renowned faculty. Texas A&M’s Distance Learning program offers many online Master of Education degrees, including: Bilingual Education; Curriculum and Instruction in General, Elementary, TESOL; Educational Technology; and many more. With basic tuition as low as $240 per credit, it’s no surprise Texas A&M’s online degree programs are growing exponentially. Cal State Fullerton is recognized by Forbes and U.S. News & World Report as a top 100 public university, and one of the best in the western region, but CSUF is more important than even those accolades would suggest. As both a Hispanic-serving institution and an Asian American-Native American-Pacific Islander-serving institution, CSUF is instrumental in bringing quality public education to minority groups and is recognized as one of the best universities for social mobility. As part of bringing CSUF to its maximum accessibility, Cal State Fullerton offers numerous online education master’s degrees, including Master of Science programs in Education Technology, Elementary Curriculum and Instruction, Instructional Design and Technology, Reading, and Secondary Education. As part of the California State University system, CSUF keeps tuition low at around $375 per credit, making Fullerton a serious value. Like Texas A&M, the University of Florida is a land, sea, and space-grant university, one of the few to combine so many distinctions, and is a U.S. News & World Report top 20 public university. UF’s individual programs are highly rated, including not only engineering and business, but the College of Education, with its high research budget and award-winning faculty. Online students can earn a master’s degree from these same respected teachers and researchers, including M.Ed. degrees in Educational Leadership, Educational Technology, Reading Education, and more, all at only $448 per credit for Florida residents. The University of Nevada, Reno, like Utah State (#5), fulfills its mission as the only land-grant university in the wide-open state of Nevada in part by investing in online education. UNR boasts over 22,000 students using their WebCampus system for courses and degree programs, making education available for students across the state who cannot reach campus. UNR’s College of Education offers numerous online Master of Education degrees, including specialization in Educational Psychology, Equity and Diversity in Education, Literacy Studies, and Informational Technology in Education. At only $264 per credit, it’s a low investment with a future as big as Nevada. While it is a relatively young public university – founded only in 1956 – the University of South Florida in Tampa is already one of the largest universities in Florida, with well over 40,000 students, and has earned a slot as one of U.S. News & World Report’s top 100 public universities. It’s also home to one of Value Colleges’ top 10 online education degrees, thanks to its combination of quality and affordability. At only $431 per credit for Florida residents, USF offers a number of Master of Arts, Master of Education, and Educational Science degrees, in specializations including less-common areas like Autism Spectrum Disorder, Adult Education, and Career & Technical Education, as well as more traditional fields like Reading. Northern Illinois University is a large, public research university in DeKalb, IL, originally founded in 1895 as a teachers’ college. It should be no surprise, then, that the College of Education retains a high degree of quality and reputation, even earning a top U.S. News & World Report ranking for their online degrees. NIU offers two Master of Science in Education degrees: Instructional Technology, and School Business Management, two programs not commonly found online from such a reputable college, giving NIU an advantage for students interested in the technical or managerial side of education. The University of Arkansas, in Fayetteville, AR, is a major public research university poised to become one of the most influential and respected institutions in the south. Thanks to massive financial support, much of it from Wal-Mart’s Walton family, UA has been on the path to national and international significance since its $1 billion fundraising efforts in 2005. U of A Online’s Master of Education degree programs have been recognized as among the best by U.S. News & World Report, and online students can choose from numerous specializations, including Adult and Lifelong Learning, Educational Leadership, Educational Technology, and many others. A private, Catholic university in Denver, CO, Regis University was founded by Jesuits and retains the dedication to quality education associated with that order. Regis is a perennial top university in the west according to U.S. News & World Report. Regis is taking a path tread by a few other prominent Catholic universities, building its student body by building a robust online presence that allows students from far and wide to take part in the unique experience of a Catholic education. Regis offers several online Master of Education degrees, including Adult Education & Training; Curriculum, Instruction, & Assessment; Instructional Technology; and Reading. For a private university, Regis’ online tuition is a shockingly affordable $475 per credit, making it a significant value. The University of Massachusetts Lowell may live in the shadow of UMass Amherst, but Lowell deserves all of the praise and reputation it has been building in recent years. As one of the top 100 public universities in the US, UMass Lowell also offers graduates one of the highest 30 year return on investment rates in the nation, at over $1 million. That’s only one reason students have been flooding Lowell; another reason is their excellent, and affordable, online education. In addition to general Master of Education degrees in Educational Administration, Reading and Language, and Curriculum and Instruction, UMass Lowell also offers Educational Specialist degrees, and degrees tailored to Massachusetts school systems, for educators who want state licensure to become principals or reading specialists, all at a low $470 per credit. As the flagship of the Indiana University system, IU Bloomington is at the center of education and research in the state of Indiana. Recognized as a U.S. News & World Report best public university, and a top 100 university nationally, Indiana University has shifted its focus in recent years to educating the state’s top researchers and professionals, including its top 20 School of Education. IU Online offers over 100 online degrees, including Master of Science in Education degrees in Instructional Systems Technology; Literacy, Culture, and Language Education; and Special Education. At $416 per credit hour, it’s an affordable investment in a top-quality degree. A top-tier university in U.S. News & World Report rankings, the University of Nebraska is the oldest and largest public research university in the state. Located in Lincoln, NE, UN is known for innovation in agriculture (developing agricultural theories that revolutionized farming in the 20th century), the humanities (such as the development of Digital Humanities), and education. UN offers many master’s degrees in education online, including Educational Administration, Science for Educators, Special Education, and more, for a bargain of $325 per credit. Like other small, private Christian colleges and universities today, Georgetown College (in Georgetown, KY, not to be confused with Georgetown University) has found that the best way to expand their reach as educators is by offering online degrees. Well-regarded for their education programs – GC is ranked as the best online graduate education degree institution in Kentucky by U.S. News & World Report – Georgetown College offers several online education degrees, including Teacher Leader, Rank 1 School Improvement, and numerous certifications such as Moderate/Severe Disabilities. With 7-week courses and a tuition of only $395 per credit (with payment options to lower that low tuition even more), Georgetown College is making their reputation in online education. A mid-sized public university in Beaumont, TX, Lamar University is growing by leaps and bounds in recent years. Since being profiled in the Washington Post in 2010 for their quality and affordability, Lamar has seen students apply in droves, and online education has been key to Lamar keeping up with demand. Lamar offers eight Master of Education degrees online, including Educational Administration, Teacher Leadership, Digital Learning and Leading, and more. Lamar’s tuition of $438 per credit makes Lamar a value for other small public universities to learn from. One of the most recognizable names in online education, Arizona State University’s ASU Online program is only one part of the vast, bold experimentation that led to ASU being named the nation’s most innovative university by U.S. News & World Report. ASU offers a number of highly-respected online Master of Education degrees, including Curriculum and Instruction specializations in Applied Behavior Analysis, Autism Spectrum Disorders, and Gifted, as well as a master’s in Educational Leadership (Principalship). Another aspect of ASU’s attractiveness, which has brought Arizona State to the status of largest university in America, is its reasonable tuition: $555 per credit for an online education master’s, a bargain for the quality. UNC Wilmington, part of the nationally-known University of North Carolina system and one of the top regional research universities in the South, has the same problem as many other regional universities – attracting students in an increasingly competitive higher education field. Like other universities of its size, UNCW has met that problem with online degrees. The Watson College of Education offers several well-regarded online education degrees, including the Master of Education (with many concentrations such as Educational Leadership, Policy, and Advocacy, English as a Second Language, and Language and Literacy); a Master of Arts in Teaching; and a Master of Science in Instructional Technology. With tuition around $266 per credit for graduate students, UNCW is a low-risk investment. Possibly the foremost university in Alabama, Auburn University is a consistent U.S. News & World Report top 50 public institution and a leader in education and research for the deep south. Best known for engineering (before it was Auburn University, it was Auburn Polytechnic), Auburn’s College of Education is also known as one of the best in the region. Auburn offers many online education master’s, including programs not often found online such as Agriscience Education, Collaborative Teacher Special Education, and Music Education. At $477 for Alabama residents, Auburn offers a top online education degree that is a proven value. One of the dominant players in online education – a rival to Arizona State (#19) in the market of major public research universities online – Penn State World Campus was one of the first in its class to take online education seriously. With that reputation and experience come some of the best-developed, most highly-ranked online programs in the nation. Penn State’s online education master’s degrees include Adult Education, Art Education, Educational Leadership, and more. And while Penn State’s $805 per credit may seem higher than other public universities, that price stands no matter the location, making it lower than most similar institutions’ non-resident rates. As the largest member institution, with the largest endowment and highest research activity, the University at Buffalo may be the foremost branch of the State University of New York system. As one of U.S. News & World Report’s top 25 online education schools, Buffalo offers online Master of Education degrees in numerous areas, such as Education and Technology, Information and Library Science, and an innovative Science and the Public program, among others. With one of the most recognizable and marketable names in higher education, the University at Buffalo should provide a significant return on your graduate degree investment. Another SUNY system institution, Stony Brook University has the same credibility and job market value that the SUNY name brings, as well as a proven reputation as a great value in quality and affordability. Stony Brook’s School of Professional Development offers an online Master of Arts in Higher Education Administration, as well as advanced graduate certifications in Educational Leadership, Coaching, and Higher Ed Administration, at a reasonable tuition rate of only around $453 per credit. Ranked by Forbes as a best college value, the University of Mississippi doesn’t often get the attention it is due as a sea and space-grant institution, one of the finest research universities in the deep south. But UM is changing that with Ole Miss Online, as they bring education in a more accessible form to the people of the region. Ole Miss Online offers Master of Education degrees in Elementary Education and Literacy Education, a Professional Master of Arts in Higher Education and Student Personnel, and a Specialist Degree in Education in Play Therapy, a specialized degree for mental health and school counselors. With their mission to provide education to the people of Mississippi, including its poorer residents, Ole Miss keeps tuition at an affordable $408 per credit. One of the challenges of the small, regional public research university is attracting students and making its educational opportunities widely available. Wright State University (named for local heroes the Wright Brothers) has always served the nearby Wright-Patterson Air Force Base, but in recent years WSU has invested a lot into their online course offerings, with clear benefits. Wright State has recently debuted cutting-edge interactive video courses, and they offer numerous education graduate degrees. Master of Education degrees include Educational Technology with specializations in Health Professions and Instructional Design for Digital Learning; Principalship; Superintendency; and Teacher Leader. Ball State University, a public research university in Muncie, IN, has a reputation for using technology for education, having been an early adopter of wireless technology (and being awarded for it by Intel in 2007). So, not surprisingly, Ball State’s online education program is fully stocked and well-designed, with numerous education graduate degrees including Adult and Community Education, Curriculum and Education Technology, Educational Psychology, and more. Ball State’s tuition is famously low, as well, with Indiana residents paying only $386 per credit for online courses, making Ball State a perennial guest on best value lists. The University of South Alabama is not as well known as Auburn (#21), but it may be soon, thanks to its location and burgeoning online education program. As one of only two public research universities in the Gulf region, USA has a large population to serve, and the most efficient way to do it is online. USA Online offers many Master of Education programs, including Early Childhood Education, Elementary Education, Secondary Education, Educational Media, and Special Education, as well as a Master of Science degree in Instructional Design and Development. With a low tuition rate of $395 per credit, Alabama residents get a quality education conveniently. Along with Arizona State (#19) and Penn State (#22), one of the first names prospective students will think of when they think of online education is Old Dominion University. From their home in Norfolk, VA, ODU has grown into an online force, with an impressive list of available degrees in just about every area. Educators and future teachers will find plenty of choices from ODU, including Master of Science in Education degrees in Educational Leadership, Instructional Design & Technology, School Librarianship, and many more, including a rare Military Career Transition Program designed to prepare returning veterans for the classroom. Virginia residents pay $464 per credit hour, but out-of-state students pay only $501, less than the in-state rate for many programs, making Old Dominion a value wherever your location. Like Regis University (#13), the University of Scranton is a private, Catholic university linking the old Jesuit educational traditions with the modern methods of online learning to spread their quality education to a wider student body. Online students can earn a Master of Science in Education degree in Curriculum and Instruction, or in Educational Administration. And while the University of Scranton’s tuition is usually over $900 per credit, US is making online education degrees more accessible with a much lower tuition of only $495 – a private, Catholic education at the price of a public university! A private research university in New York City (the village of Old Westbury, Long Island), the New York Institute of Technology is known for its research in technology, with the distinction of being the birthplace of 3D computer animation. As a technology school, it should not be surprising that NYIT offers fully online degree programs, including Master of Science degrees from the School of Education in Adolescent Education (with specializations in Math or Science), Childhood Education, and Instructional Technology. Tuition for School of Education online degrees is considerably less than NYIT’s usual tuition at only $500 per credit hour, making an NYIT graduate education degree a surprising value. A public research university in Cincinnati, OH, the University of Cincinnati has a strong presence in the region and nationally, with one of the largest student bodies in the nation and the quality to back up that demand. Cincinnati’s online education program has been ranked in U.S. News & World Report’s top 25, with numerous Master of Education offerings and even more specializations. Online students can earn an M.Ed. in Curriculum and Instruction, with concentrations in Gifted, Creative, and Talented, STEM, or Teacher Leader; in Educational Leadership; in Literacy & Second Language Studies; in Medical Education for Health Care Professionals; or in Special Education. Less than an hour’s drive from the University of Cincinnati, the University of Dayton is a private Catholic university founded by the Society of Mary. As with Regis (#13) and Scranton (#30), the University of Dayton has learned to compensate for a changing higher education market with online degree programs. To make a quality graduate education degree more accessible, Dayton offers numerous online licensure and non-licensure programs, including Master of Science in Education degrees in Educational Leadership, Interdisciplinary Education Studies, Technology-Enhanced Learning, and much more. Dayton’s $603 per credit online tuition is a solid value for a private education. While UMass Lowell (#14) may have come in earlier on the Value Colleges ranking, don’t count out UMass Amherst, the flagship of the UMass system. As the largest public research university in New England, UMass has the reputation to be a consistent U.S. News & World Report top-ranked institution, not to mention having one of the most-loved college towns in America. UMass Online is one of the most respected names in online education, and offers more than 20 education degrees, including Master of Education programs in unusual areas such as Vision Studies (for teaching visually-impaired students) and Learning, Teaching, and Educational Transformation (for students interested in innovative and non-traditional methods). Alongside more traditional concentrations, UMass makes these degrees a value at only $470 per credit hour. Like other regional, public research universities, Central Michigan University has put a strong emphasis on building online programs, and it has paid off, with recognition from U.S. News & World Report for their online graduate and bachelor programs. CMU offers a Master of Arts in Education degree with concentrations in Curriculum and Instruction, or Training and Development; an MA in Educational Leadership (with specializations in areas such as Charter School, Rural, and Virtual Education); an MA in Educational Technology; and an MA in Reading and Literacy. From Central Michigan to Central Missouri, we find the University of Central Missouri, a regional public research institution in Warrensburg, MO. UCM offers several education graduate degrees, including Master of Education degrees in Curriculum and Instruction, and in Elementary Education: a Master of Arts in Teaching; and Master of Science degrees in Instructional Technology and in Library Science and Information Services. 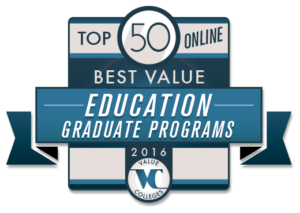 Online graduate students pay an incredible $324 per credit hour, making UCM one of the most affordable online graduate degrees out there. Florida State University is one of the most recognized public research universities in the south, and a U.S. News & World Report top 50 public institution. Noted for their diversity, especially in degrees awarded to Hispanic students, FSU has worked for decades to make education more accessible, a mission that has led [email protected] to develop dozens of online degree programs. Educators can earn a Master of Science degree online from the College of Education in numerous concentrations: Curriculum and Instruction, Educational Leadership, Instructional Systems and Learning Technologies, Learning and Cognition, and others. A Very High Activity public research institution in Atlanta, GA, Georgia State University is perfectly placed in one of the most dynamic and innovative cities in America, a key component to its quality and significance in the south. GSU’s College of Education offers several accredited online master’s degrees, including M.Ed. degrees in Mathematics, Science, and Reading, Language, and Literacy, as well as a Master of Science in Educational Research. As a public university, GSU keeps education affordable, with a $385 per credit hour tuition, regardless of residency. While Ole Miss (#25) gets all the glory, Mississippi State University is also carrying on the hard work of providing an affordable, reachable education for the people of Mississippi. Like the other public institutions on the Value Colleges ranking, MSU has found a way to do its job with online degree programs, including Master of Arts in Teaching degrees in four concentrations: Community College Education; Middle Level Education; Secondary Teacher Alternative Route; and Special Education. At $416 per credit, for Mississippi residents or non-residents, MSU offers a degree more affordable than some public universities’ resident rates. Like many regional public universities, East Carolina University was founded as a teachers’ college, and the College of Education is still the most prominent in North Carolina, publishing an internationally-known scholarly journal (the Journal of Curriculum and Instruction) and educating more NC teachers than any other institution. Of course, ECU offers more online education degrees than perhaps any other institution in the region: a Master of Arts in Education (for NC licensed teachers) with more than 10 concentrations; MS degrees in Instructional Technologies and Vocational Education; and other specialities such as Adult Education and Music Education. At only $233 per credit for North Carolina residents, it’s no surprise ECU is a top value. Kennesaw State University, in Kennesaw, GA, is a public university on the rise. KSU has been named by U.S. News & World Report as an up-and-coming school, with their innovative First Year Experience program particularly cited. Another area of innovation is Kennesaw State’s robust online education program, which includes many Master of Education degrees. Online students can earn M.Ed. degrees in Teacher Leadership, Special Education, Education Technology, and many more, for only $408 per credit. Sister institution to UNC Wilmington (#20), the University of North Carolina at Greensboro has been recognized by the Princeton Review, as well as Kiplinger’s as one of the best value public universities in the US, a distinction made by the UNC system’s combination of excellence and affordability. At only $266 per credit for NC residents, UNCG offers one of the cheapest programs around, but students receiving distance education outside of North Carolina still pay only $505 per credit. Online students can earn M.Ed. degrees in Interdisciplinary Studies in Education and Development or Curriculum and Instruction, but specialized Master of Arts degrees in Dance Education and Master of Science in Nursing Education are also available. hough it was not founded by George Washington (whose endowment, meant for founding a college, was scuttled by bad investments), George Washington University was named in his honor. This Washington, DC institution is known as the most political campus in the US, and has educated numerous politicians and leaders. GWU was also a pioneer in online education, and retains a high-ranking reputation for its online programs. Educators can earn a Master of Arts degree in Educational Leadership and Administration, Educational Technology Leadership, and Special Education for Culturally and Linguistically Diverse Learners. GWU’s tuition is not cheap, but the George Washington University name is one of the most recognizable and trusted on the job market, making an online GWU a sound investment. The flagship of the University of Missouri system, the University of Missouri in Columbia, MO, has one of the most impressive online education systems in the US, rivaling Penn State, Arizona State, and Old Dominion with nearly 100 degrees and certificates. Mizzou Online is highly ranked, and includes more than 15 Master of Education degrees, in such diverse fields as Autism Education, TESOL, Business and Marketing Education, and Gifted Education. One of most affordable programs, Missouri residents and non-residents alike pay the in-state rate of $350 per credit, making Mizzou a value that’s hard to beat. Like Kennesaw State (#41), the University of South Carolina is a U.S. News & World Report-designated up-and-coming institution, with their online education program ranked #15. USC’s online education offerings are growing, in number and reputation, including their Master of Education degrees. Currently USC offers M.Ed. degrees in two areas, Teaching and Education Administration, but at around $480 per credit, it’s a solid value for South Carolina residents. Another U.S. News & World Report up-and-comer, Boise State University is recognized as a best regional public university for the west, best known for their engineering school. The Boise State eCampus offers two Master in Teaching degrees: Special Education, and Early Childhood Intervention. At $358 per credit, Boise State’s online education degrees are affordable, and the only way for Idaho residents to earn a master’s degree and teacher certification in one two-year program. Founded in 1804, when Ohio was still frontier, Ohio University is one of the oldest, most established and trusted public universities in the US, located in Athens, OH, one of the most beloved college towns. This tradition and heritage hasn’t kept Ohio from embracing technology, however, and OHIO eCampus offers numerous online Master of Education degrees from the Patton College of Education. Ohio’s online programs include unusual offerings such as Coaching Education and Recreation and Sports Sciences, in addition to Reading Education and Advanced Curriculum and Instruction. At $523 for Ohio residents, it’s a bargain, but non-residents pay only about $20 more, making Ohio University an incredible value. Eastern Kentucky University has long been considered in the top tier of regional universities in the south, and is recognized as one of the most military-friendly schools in the nation, largely because of their well-developed online programs that make education convenient for active duty service members. EKU’s online graduate education programs have been recognized by U.S. News & World Report as among the best, though non-Kentucky residents should be aware that some individual programs require clinical hours that are not online. But at $500 per credit, it’s a deal for Kentuckians. The University of Illinois system flagship, the University of Illinois at Urbana-Champaign has the reputation of a Public Ivy and a consistent place on U.S. News & World Report’s top 10 and top 20 rankings. Illinois’ College of Education offer many online Master of Education degrees, in fields such as Diversity & Equity in Education, International Education Administration & Leadership, Global Studies in Education, and more. With tuition and fees for online courses at $654 per credit, Illinois is a little higher than other public universities, but it’s a value for the UI name. A respected HBCU in Greensboro, NC, North Carolina A&T State University has responded to the demands of the contemporary higher education climate, which has been harsh for HBCUs, by building their online offerings. As the largest HBCU, and U.S. News & World Report’s #1 public HBCU, NC A&T has found a way to provide an education to those who would be left out, including a number of Master of Arts in Teaching and Master of Science degrees. Programs include Business Education, Technology Education, and Instructional Technology, among others. And for NC residents, tuition is an incredible $218 per credit, making NC A&T a value among values.